This event is in English, but with some gorgeous, traditional Tibetan chanting and melodies mixed in. Add your voice to the call for harmony and prosperity in all schools, lineages, traditions, monasteries, and sanghas, and in our society and the natural world! 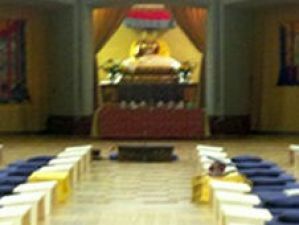 Rimay: "Honoring and including all schools and traditions of Buddhadharma." Monlam: "An articulation of purpose; a mission statement; a formulation for realizing our highest aspirations." Visit the Rimay Monlam site to learn more. Visit the Garrison Institute Registration Site to register.